Now that we’ve been blogging ‘bout macaroni and cheese for several months, people are starting to ask whether we are getting tired of cooking and eating “the same thing” all the time. Fortunately, there is an infinite variety of macs. Between the vast array of possible cheese choices, an encyclopedia of pasta shapes and controversial add-ins like bacon and chiles, we’ve barely scratched the surface! Today’s recipe is from celebrity chef Alex Guarnaschelli, who sighs in the most angelic way when discussing her favorite foods on television. The recipe caught my eye because it uses neither roux nor eggs, and those were the two main categories we’ve already sampled in these pages. Instead, and how could this be bad, Alex’s macaroni bathes in a cheese sauce that uses an entire quart of heavy cream as its foundation. Garlic-infused heavy cream! Is your mouth watering yet? Are your arteries hardening yet? Maybe do a little extra cardio the day you eat this. But in case the creamy decadence frightens you, please note that there is no butter whatsoever in this mac, which is ironic because Butter is the name of Alex's NYC restaurant. Normally I would consider the lack of butter to be an abomination, but considering the big jug o’ cream, it all balances out. Another first: This recipe specifies precisely how much water you should use for cooking the macaroni. I believe that is because Alex incorporates a cup of the starchy cooking water into the sauce, and if you were to boil your pasta in a lot more or a lot less water, the consistency of the reserved cooking water would vary. Ladle out some cooking water before you drain the noodles, or you run the risk of forgetting this step (like I almost did). This macaroni and cheese is flavored with crushed garlic cloves that steep in the cream as you heat it. Then you add a dollop of Dijon mustard, which usually is not my favorite but its pungency pairs perfectly with the earthy Gruyere that makes up the bulk of the cheese contingent. The final seasonings are Worcestershire sauce, which many correspondents have mentioned as being “Grandma’s mac and cheese secret,” and a hot sauce of your choice. I grabbed the Tabasco this time, but I think Frank’s or any number of other brands would be lovely too. Being the only person in the kitchen, I was challenged to get a good action photo of the adding-the-hot-sauce step, and yes, I kept missing the shot so I did what any self-sacrificing blogger would do: add more and more Tabasco. Fortunately, it didn’t overpower the dish. I’d say six or seven good dashes found their way into this batch of mac, and it was not overkill. In fact it was delicious. Along those lines, since I love garlic, next time I’ll just mince it and leave it in the cream instead of trying to fish out the crushed cloves. Or maybe I’ll incorporate garlic into the breadcrumb topping somehow, because that was the one area for improvement that I could identify. Mine seemed a tad anemic. Perhaps this is where a bit of butter could do some good! The mixture looked pretty soupy going into the oven but the sauce thickened nicely while baking. I think it helps to cook your macaroni just short of the al dente stage, so that the pasta can still absorb the sauce and release a bit of starch in return. When I spooned the finished mac onto my plate I could hardly wait to dig in. I mean, look at how that velvety sauce bubbled up along the edge of the baking dish! I must admit that the cream-based sauce felt unusual in my mouth. The richness was a little waxy, perhaps? It coated my tongue the way cream coats a spoon. It was not an unpleasant sensation, just different. 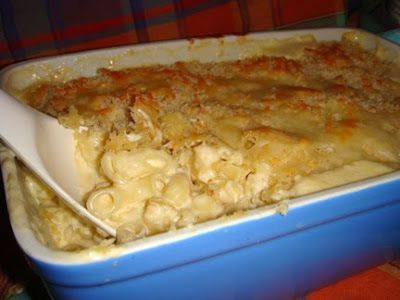 This macaroni and cheese should be enjoyed straight from the oven. When reheated, the sauce broke down completely. This was a huge disappointment because I was looking forward to enjoying this mac again. The flavors were still there, but they’d been absorbed into the pasta and the creaminess was absent. Maybe next time I will cut the recipe in half, or quarters. Added benefit of this approach: one cup of heavy cream sounds a lot less dangerous than one quart. In a large pot, bring the water to a rolling boil. Add salt. Taste the water. It should be salty like sea water. Add the macaroni and stir, with a wooden spoon or large slotted spoon, to ensure the macaroni does not stick to the bottom of the pot as it cooks. Cook until the macaroni is still quite firm, 8 to 10 minutes. Pour the macaroni and water into a strainer placed over the sink. Allow the water to drain out, reserving approximately 1 cup of the liquid. 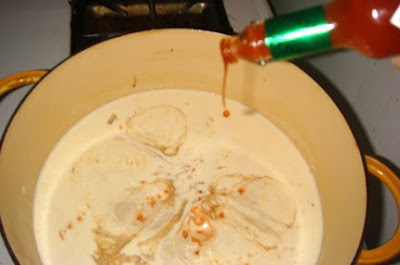 In the same pot, bring the cream, garlic cloves, and the reserved cooking liquid to a simmer. Add the mustard and 3 cups of the Gruyere. Season with salt and pepper to taste. Simmer gently, stirring constantly, until the cheese is melted and has integrated with the cream. Add the Parmesan and Cheddar. Stir with a wooden spoon and simmer again until smooth. Add a splash of Worcestershire and a splash of hot sauce. Stir to blend. Taste for seasoning. 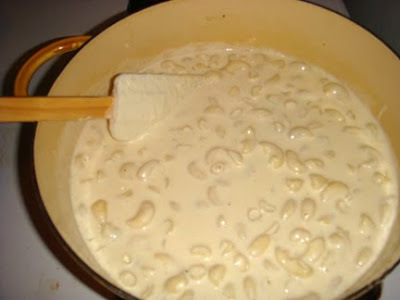 Add the macaroni to the cream and stir gently to blend. Allow the macaroni to rest on the stove, 5 to 10 minutes, so the pasta absorbs the flavors. Remove and discard the garlic cloves. 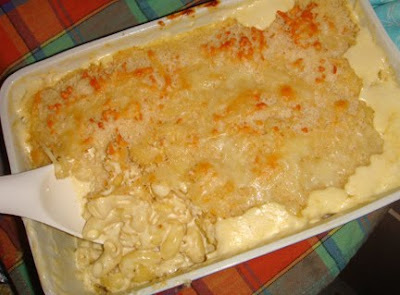 Fill a baking dish with the macaroni mixture. Top with the bread crumbs and the remaining Gruyere cheese and bake 10 to 12 minutes or until the bread crumbs crust on top. Serve immediately. The only thing that came to mind was "Oh my heaven." This is going on my 'to-make' list.